In cadugan’s defense, if I know anything about mothers, even hearing Charles side of the story won’t stop their mom from seeing it that way. He’s got the ultimate defense, "Hey, I’M not the one that went and got myself turned into STONE, right? So WHO ran into incredible danger? And WHO stayed safe AND rescued him??" And Mother has a comeback: "You did, and I’m glad someone saved him, but you still disobeyed me. You’re still grounded." Not going to tear up at the sight of Cadugan and Lucas well again. Not going to…aww, damn it. *sniffle* 🙂 Welcome back, gentlemen. We missed you! Yes, it’s wonderful to see Cadugan and Lucas in the flesh again. Welcome back, you two! And they are getting RIGHT back into character! Charles: "Hey, Gram, my brother needs some more salve. His personality is still set in stone!" To wit: He is hard-headed. That’s fair. He should be congratulated and rewarded for saving their lives multiple times and showing resourcefulness worthy of a hero. But he still disobeyed his mother and his brother and took an incredibly stupid risk that quite rightly should have gotten him killed. So… runs in the family? running off into danger like a total idiot? Pretty much standard hero stuff. It sounds like the kind of stuff that might get him adopted as heir to grayfort. If he hadn’t you’d still be a LITERAL "hardass"
Better to be a figurative one I suppose. Just you know, pointing out the obvious. I’d say at least Cad’s mission got him into the nobility but then I remembered he was already royalty, and being a duke consort or whatever is technically a downgrade. Charles at least has a ways to go up and is rescuing the right people to do so. Why is it a downgrade? His position in human society doesn’t change the fact, that he is an elven royalty. Just like Glon: regardless how he was seen among humans, under the Montain he still was a prince. There’s also the fact Cadugan is an adult and an experienced ranger. 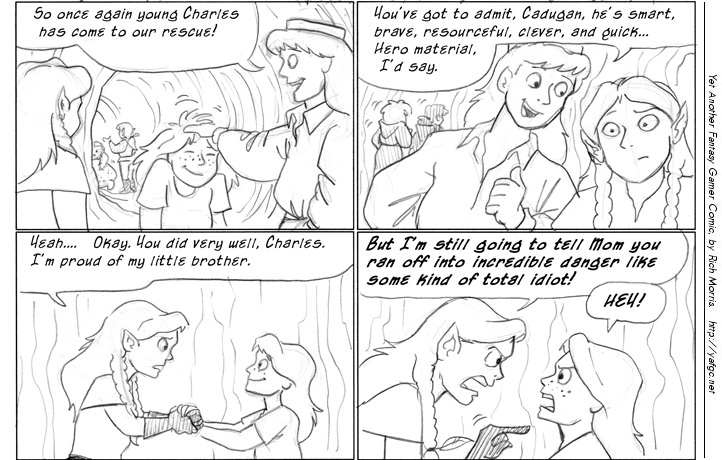 Charles is still barely in to puberty, if he’s even there at all. Also the fact his mom told him no. That’s the difference. When I found this comic months ago everything behaved properly. There was a minor issue with the banner add consuming the entire screen, but a refresh usually cleared it. A month ago navigating the comic started opening pop-up windows and creating re-directs, at which point I shelved the comic and hoped the issue would be cleaned up eventually. Today when I wanted to look for a specific comic, both the cast-page and archive pages are broken, displaying only "Fatal error: Unknown: Cannot use output buffering in output buffering display handlers in Unknown on line 0". This is an issue on both desktop chrome and edge. I really like your comic and I want to archive binge again. I hope these things can be fixed. I know. I’m pretty crushed about it. I’m trying to work out the problem as I use the archive function rather extensively myself. Sorry this is an inconvenience, I’m hoping to have it back to normal soon. That’s weird cause I’ve never had any problems. If it was a website issue everyone should be experiencing it, no? Seriously??? Can you still access the archives? I can see the archives, but not if I go in through the Archive page. I can get there through "Related Comics" and jump around, though not quite as conveniently or specifically. I recall last time I visited the archive page, it was getting rather large and slow to load. I suspect the problem is with the archive page itself, not the actual archived pages, which I can still access through "Related Comics." Sorry for late reply. I mean, I can access the main comic. This one here. Never been to the archives. Don’t even know what they are. Yep, I can browse through the episodes using the |< < > >| buttons above. Just noticed there’s an ARCHIVE link in the top menu. Never used it. I can’t access the main archive page or the cast page, but the "Characters" links (which I tend to use more often) are working – somewhat. I get the first page of hits, but then the navigation buttons to get to the next ones are missing. Oh, now I see navigation links (don’t know if I missed them or you fixed it), although previous and newer are working backwards. It’s a temporary fix. But it’s all taking so long to work out. Apologies. He probably just doesn’t want to lose another brother.